Graphene comes from graphite. Andre Geim and Konstantin Novoselov used the weak bond between the layers of graphite to isolate the three strong bonded carbon atoms and discovered graphene. Without the layer of weak bonds, graphene is a structure that is only one atom thick. Hence, it is a two dimensional object. It is one of the thinnest and strongest material ever measured. The structure resembles chicken wire when viewed on the atomic scale. Geim and Novoselov shared the 2010 the Nobel Prize for Physics for the discovery. The two scientists in the March 2007 issue of Nature Materials defined graphene as "a flat monolayer of carbon atoms tightly packed into a two-dimensional (2D) honeycomb lattice, and is a basic building block for graphitic materials of all other dimensionalities. It can be wrapped up into 0D fullerenes, rolled into 1D nanotubes or stacked into 3D graphite." 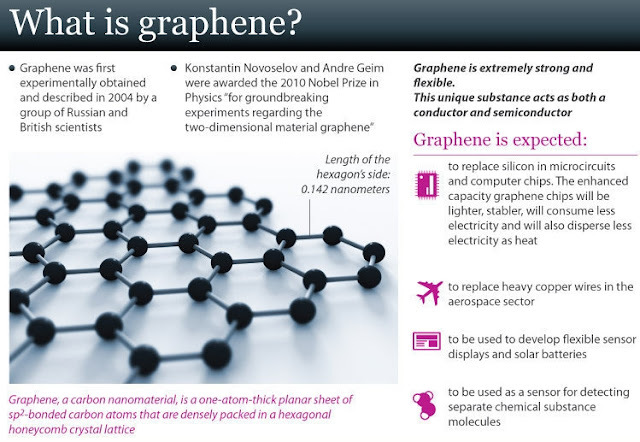 Graphene is a material that has the potential to create foldaway mobile phones, wallpaper-thin lighting panels and the next generation of aircraft. A graphene circuit can operate at high frequencies of up to 10GHz (10 billion cycles per second), and at temperatures of up to 127°C. It is the most transparent, strongest and most conductive material on Earth. "We have been able to demonstrate and explain the strong nonlinear response from graphene, which is the key component in this new hybrid device," says Tingyi Gu, the study's lead author and a Ph.D. candidate in electrical engineering. "Showing the power-efficiency of this graphene-silicon hybrid photonic chip is an important step forward in building all-optical processing elements that are essential to faster, more efficient, modern telecommunications. And it was really exciting to explore the 'magic' of graphene's amazingly conductive properties and see how graphene can boost optical nonlinearity, a property required for the digital on/off two-state switching and memory." The study, led by Chee Wei Wong, professor of mechanical engineering, director of the Center for Integrated Science and Engineering, and Solid-State Science and Engineering, will be published online in the Advance Online Publication on Nature Photonics's website on July 15 and in print in the August issue. The team of researchers from Columbia Engineering and the Institute of Microelectronics in Singapore are working together to investigate optical physics, material science, and device physics to develop next-generation optoelectronic elements. They have engineered a graphene-silicon device whose optical nonlinearity enables the system parameters (such as transmittance and wavelength conversion) to change with the input power level. The researchers also were able to observe that, by optically driving the electronic and thermal response in the silicon chip, they could generate a radio frequency carrier on top of the transmitted laser beam and control its modulation with the laser intensity and color. Using different optical frequencies to tune the radio frequency, they found that the graphene-silicon hybrid chip achieved radio frequency generation with a resonant quality factor more than 50 times lower than what other scientists have achieved in silicon. "We are excited to have observed four-wave mixing in these graphene-silicon photonic crystal nanocavities," says Wong. "We generated new optical frequencies through nonlinear mixing of two electromagnetic fields at low operating energies, allowing reduced energy per information bit. This allows the hybrid silicon structure to serve as a platform for all-optical data processing with a compact footprint in dense photonic circuits." Wong credits his outstanding students for the exceptional work they've done on the study, and adds, "We are fortunate to have the expertise right here at Columbia Engineering to combine the optical nonlinearity in graphene with chip-scale photonic circuits to generate microwave photonic signals in new and different ways." 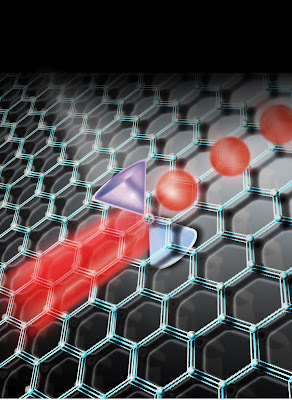 Ultralow-power optical information processing is based on graphene on silicon photonic crystal nanomembranes. Until recently, researchers could only isolate graphene as single crystals with micron-scale dimensions, essentially limiting the material to studies confined within laboratories. "The ability to synthesize large-area films of graphene has the obvious implication of enabling commercial production of these proven graphene-based technologies," explains James Hone, associate professor of mechanical engineering, whose team provided the high quality graphene for this study. "But large-area films of graphene can also enable the development of novel devices and fundamental scientific studies requiring graphene samples with large dimensions. This work is an exciting example of both—large-area films of graphene enable the fabrication of novel opto-electronic devices, which in turn allow for the study of scientific phenomena." Commenting on the study, Xiang Zhang, director of the National Science Foundation Nanoscale Science and Engineering Center at the University of California at Berkeley, says, "this new study in integrating graphene with silicon photonic crystals is very exciting. Using the large nonlinear response of graphene in silicon photonics demonstrated in this work will be a promising approach for ultra-low power on-chip optical communications." "Graphene has been considered a wonderful electronic material where electron moves like an effectively massless particle in the atomically thin layer," notes Philip Kim, professor of physics and applied physics at Columbia, one of the early pioneers in graphene research and who discovered its low-temperature high electronic conductivity. "And now, the recent excellent work done by this group of Columbia researchers demonstrates that graphene is also unique electro-optical material for ultrafast nonlinear optical modulation when it is combined with silicon photonic crystal structures. This opens an important doorway for many novel optoelectronic device applications, such as ultrafast chip-scale high-speed optical communications."